I want to thank Sharla for the lovely awards she bestowed upon me. It is with great pleasure and pride that I accept them. Thank you http://catnipoflife.wordpress.com/. Please be sure to visit her incredible blog and say hi. 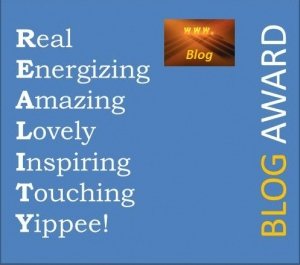 So-o-o-o glad you accepted the awards..you ‘Shine On’ with the ‘Reality’ of your life’s experiences! Hope all is going will with your books! Thank you my friend. I have finally been able to republish the edited version of my book just like I promised. It will be available in approx 5 days. The second book is being edited as I go by a proofreader and editor. Congratulations, Chris:>) Have you had ANY time for just you? lol I have had to I was in another accident where someone hit a deer and threw it into our lane right in front of us when we hit it. Thank God it was dead first I would be devistated to know it was suffering. I am recouping a sore bacxk and arms and a badly damaged van. We will be ok with time and rest.